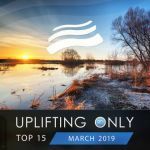 Winner of the Future Favorite honor on A State of Trance and the Fan Favorite title on Uplifting Only, Endless is a lively, energetic, euphoric, and sentimental beauty from the one and only uplifting master illitheas. It's full of both pure uncontainable sentimental joy and also a beat that will get people moving. This is pure genius. What you will never forget after hearing Endless is its unbelievable climax. You will be flying for sure. It's not what you usually expect from typical emotional uplifting trance, but it's brilliant: the main lead has an unusual electro-y twinge, and rather than be arpeggiated in the typical way, it consists of only 2 or 3 notes per bar, much more minimalist than what we normally see in the genre. This main lead interacts brilliantly with the steady second lead, which provides a more steady underpinning, even launching pad, for the main lead's jumps and flights into the air and its rare touchdowns to earth. And if you need to get people dancing but you don't have proper speakers and all you have is a laptop's built in speakers, the climax of Endless comes to the rescue. It will get people moving for real even when your speaker system has no bass. Now that is impressive. The release also includes an intro mix and a radio edit. You will love Endless, and so will everyone you know. Now time to share this masterpiece with them!